Watch world records set today by pilot Alex Baumgartner as he jumped from the edge of space during is one-in-a-lifetime Red Bull Stratos Live Jump from capsule lifted into space by a balloon thinner than a sandwich bag. Relive the excitement by watching Baumgartner’s incredible jump. Blue Man Group, the international entertainment phenomenon, partnered with Red Bull to mark the launch of its latest awe-inspiring show at its new home Monte Carlo Resort and Casino earlier this morning. 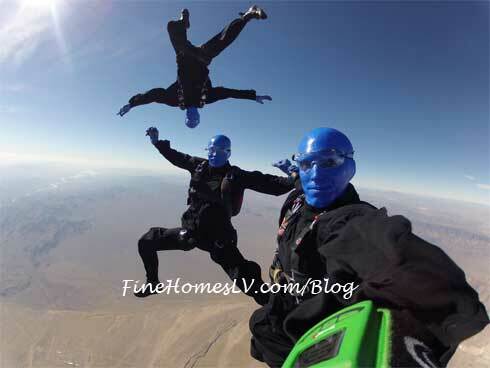 The Blue Men, trained by the Red Bull Air Force, completed a sensational leap from 7,000-feet above the property, landing in front of their new home on Rue De Monte Carlo to celebrate opening day of the new production. DJ Tribute to Stevie Wonder during WONDER-Full at The Palazzo Las Vegas Resort on Friday, August 14, 2009. The events will take place at the AZURE pool, from 2 – 8 p.m. DJ Bobbito and DJ Spinna, respected DJs from New York City, will be spinning all Stevie Wonder covers, exclusives, remixes and samples.